Being vegetable farmers, we don’t eat out a lot. When we do go into town and want to eat out, we tend to stay away from chain restaurants. In a pinch we are willing to eat at Panera or Chipotle. There are many reasons for this that I won’t go into now, but suffice it to say, we can eat better at home. I was full of humble pie. All the way home we would look at each other, laugh hysterically and I would just shake my head. I was so sure. Once home it was clear that I needed some comfort food. We settled on homemade Mac-N-Cheese. At least it was something I could be sure of! In the beginning, mac-n-cheese for me was made with good old-fashioned Velveeta and plenty of it. Then we upgraded to Kraft, as it was cheep and easy. Sometimes we would even jazz it up with a little diced ham. After having my fill of this approach, when I was single and low on cash, I started looking for the real thing. I soon found there are many approaches to homemade mac-n-cheese. 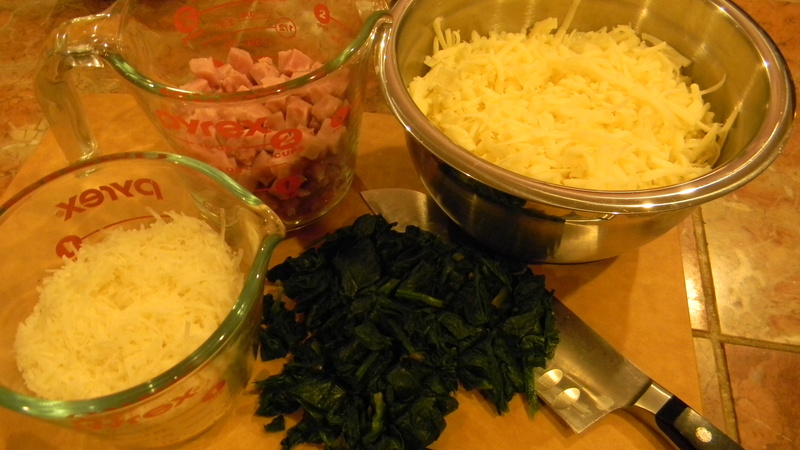 I now use a version which enables me to use many different kinds of cheese, along with protein and vegetable additions. I appreciate a recipe that offers so much flexibility and that can be adjusted to the diners preferences. Top it with homemade breadcrumbs and bake it for a real down-home and satisfying dish. Pre-heat your oven to 350 degrees F. Place bread crumbs on cookie sheet or jelly roll pan and toast lightly (about 8-10 minutes). Place toasted bread crumbs in bowl and toss with butter, garlic and cheese. Set aside. Melt butter in a heavy-duty saucepan or Dutch oven on low. Whisk in flour and continue to whisk over low heat for about 3 minutes. The butter and flour should gently bubble without coloring. Slowly add the milk, while whisking constantly. 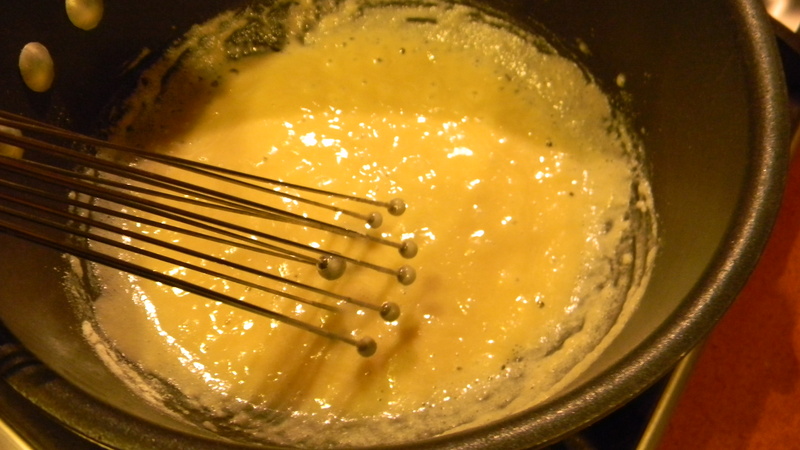 Whisk until the sauce is smooth and has the consistency of heavy cream, about 6-10 minutes. Raise the heat to medium and bring the sauce to a simmer, continuing to whisk constantly. Lower the heat to maintain a gentle simmer and cook for 10 minutes. Turn off heat and gently whisk in your cheeses and any herbs and spices you have selected. Combinations of vegetables and/or proteins up to 3 cups such as: frozen peas, carrots, cauliflower, broccoli, ham or prosciutto, scallions, Brussels sprouts, mushrooms, chard or kale, bacon or pancetta, jalapeno or Serrano chiles. Make sure you cut and cook your vegetables until just tender or al-dente before adding them. Fry your bacon or pancetta ahead of time, then drain on paper towels. Use 16 oz or 1 lb of pasta such as: elbows, shells, penne, campanelle, ziti, cavatappi, rotini or pipette. Boil the pasta according to package directions, less one minute. Drain and place it back in warm pot to combine the rest of the ingredients. I do this while I’m making the cheese sauce. Mix pasta, cheese sauce and add-ins to combine. Place in 13×9 inch casserole dish, and top with reserved breadcrumbs. Place in 350 degree oven for 20 minutes or until hot and breadcrumbs are golden. Serve immediately. 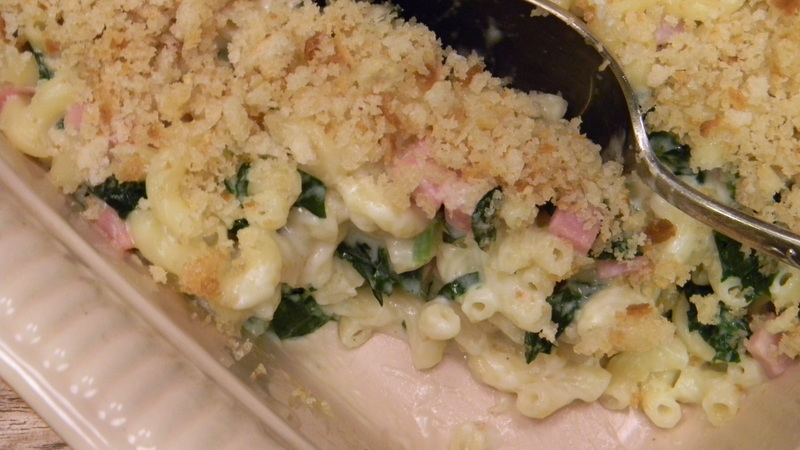 This entry was posted in Recipes and tagged food, humility, mac and cheese, raves, recipes. Bookmark the permalink. Hi 🙂 I will let you know. Thanks so much for stopping by my blog, for the follow and adding me to your blogroll – I so much appreciate it. 🙂 Have a great weekend. Glad to do it! I’m subscribed to your blog and look forward to following you. We love pasta!